Custom Made Flower Essences are available with a consultation. or just a healthier lunch box option? You can purchase these great products and more through our affiliate link with Superfoods For Kidz! With fussy eaters its sometimes hard to know if they have eaten enough variety to meet their daily fruit & vegetable needs. By adding these powders to smoothies, dinners and snacks you can be sure that they are getting what they need while we work on encouraging good varied eating habits. Click on the link to check out some yummy nutritious products. Welcome color and health into your life with Dr. Deanna Minich’s detox program, Whole Detox! 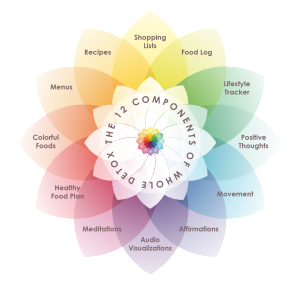 In the program, Dr. Minich leads you through her 21-day personalized plan that will help you achieve not only physical health, but also mental, emotional, and spiritual health! The era of traditional detoxes is over – learn more at _our affliate site.